It’s likely that multiple other gadgets surround your TV. Perhaps, you have a game console(s), an Apple or Roku TV, or a DVD player. Connecting the cords with all such electronics around one place barely makes for a great appeal. Sure, it’s possible to hide that terrifying web of cords. But, what happens if your flatscreen TV mounted on a wall? What if you’re running your projector all the way from the ceiling? Nyrius have developed this unit, particularly for such needs. It’s a little peripheral that effectively replaces long HDMI cords with reliable wireless signals. The ARIES Pro allows for the transmission of audio/video from your console or PC to your projector or television at a distance of up to 100 feet away. It’s undeniably an impressive offering, especially when you take the fantastic audio and video quality into account. 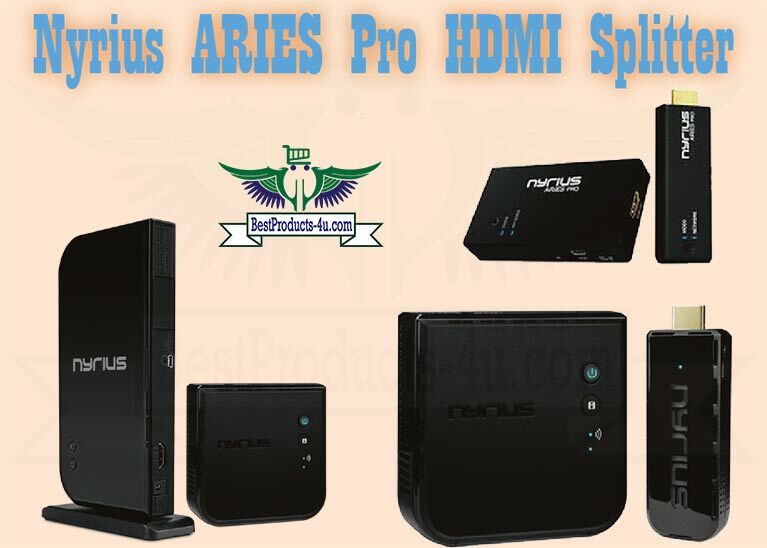 So, what should you know about the Nyrius ARIES Pro before purchasing it? That’s what this piece delves into. It attempts to determine whether or not buying the Nyrius ARIES Pro HDMI dongle would be a worthy investment. We look at its upsides, as well as the downsides. Nyrius is a famous, reputable, and well-established company which specializes in manufacturing and distributing wireless equipment. They boast having nearly everything, from home networking equipment to wireless smart light bulbs. Worth mentioning is the fact that they have re-assuring experience in developing innovative wireless HDMI extenders. That’s actually among the top things that make them an outstanding contender in the crowded marketplace. And, the ARIES Pro stands out as among the most innovative and reliable wireless HDMI kit in their extensive product line. The ARIES Pro will sit next to your TV just like any other AV component you have. It’s conveniently compact. It’s much smaller when compared to an Apple TV. It’s incredibly simple and easy to set it up, as well, taking only a few minutes. Just set it up near your source before plugging in an HDMI cable. It has power indicator lights at the top and blue LEDs below. The latter indicates the signal quality. The large piece on its left connects to your television using an HDMI cable. On the right, you’ll find a dongle for your game console, tablet, or PC. In case your PC doesn’t have an inbuilt HDMI output, you can make use of an adapter. However, you’ll need to purchase that separately. This HDMI Kit delivers a crisp, yet vibrant HD signal, regardless of whether you’re playing games, surfing the Internet or transmitting video footage. You’ll be left feeling in total control, which is what you’d ideally want. It’s capable of handling both 3D and non-3D 1080p video. Although some users have reported cases of visual differences, they’re not significant. You might come across a few instances of visual artifacts or catch sudden bits of fuzziness. But, these barely last half a second. Don’t expect errors when sending raw data. The ARIES Pro offers a maximum range of 100 feet. In turn, it’s a perfect option for drone use or in live video. Besides, it’s ideal for watching Blu-Ray video in the bedroom when your player is in the living room. The ARIES Pro is the best wireless HDMI transmitter which has zero lag. That makes it ideal for real-time applications such as drone use or video production. While it barely supports 4K video, this splitter is still among the top-rated, latest generation products. It doesn’t recompress the video. Instead, it simply makes use of a wireless protocol to transmit the raw, unmodified data in real time. In turn, that guarantees you of superior compatibility with virtually all situations. That’s something we can’t say about most transmitters, right? The ARIES Pro gives you a solid, consistent unit that’s incredibly simple to use in many ways. It’s powerful and flexible, making it ideal for both in-home use and on-location work. The tolerable occasional signal drops and minor visual degradation won’t get in the way of your experience. They can be considered a trade-off for the remarkable wireless connectivity. 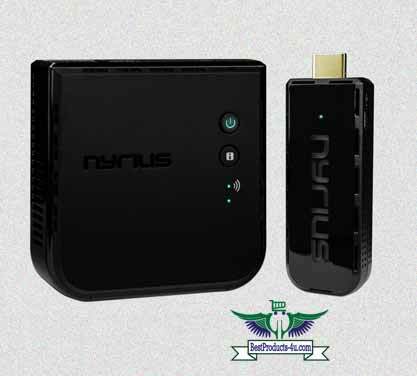 The Nyrius Aries Pro Wireless HDMI Transmitter and Receiver impresses in a significant number of ways, from performance and form to function. For the price of such a versatile HDMI splitter, you get the real value that you’d be hard-pressed to obtain from another similar offering. nyrius-aries-pro-hdmi-transmitter-and-receiver-review	Overall rating:	5	out of 5 based on 1	reviews.